Growing up, I always looked forward to Easter. I loved getting that new outfit for church, my Easter basket, Easter egg hunting and spending time with the family. As I have gotten older, those traditions are still a part of me today and one thing that never gets old is Easter egg hunting with the kids followed by brunch with the family. The competitive side in me that wants my kids to get all the Easter eggs knows heels and running in grass are a no go. The stylish side of me who wants to look elegant and chic at brunch knows sneakers to brunch for Easter are a no go. With limited time to run home and change in between events, I’ve learned that my go to Easter look must be able to be worn two different ways. That is why I created a fun, yet elegant Easter outfit. This look will transition from one event to the other seamlessly. By simply switching my accessories I am able to transform my chic Easter outfit into a casual-cool look I can wear to watch the kids hunt for eggs, or pick up an easter card to share before brunch. The look starts with 2 classic yet chic items, a yellow knit polo and a wrap midi skirt. Although both items are timeless they are also major spring trends. 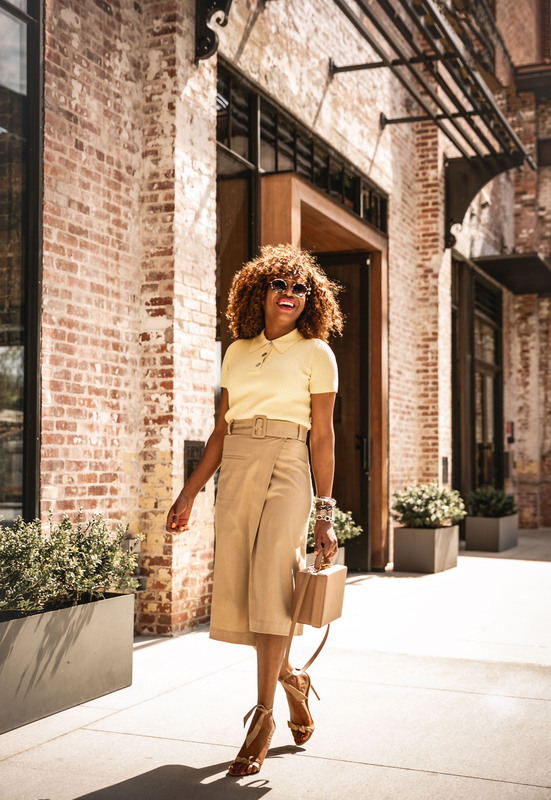 See how I switch up the looks with accessories below! 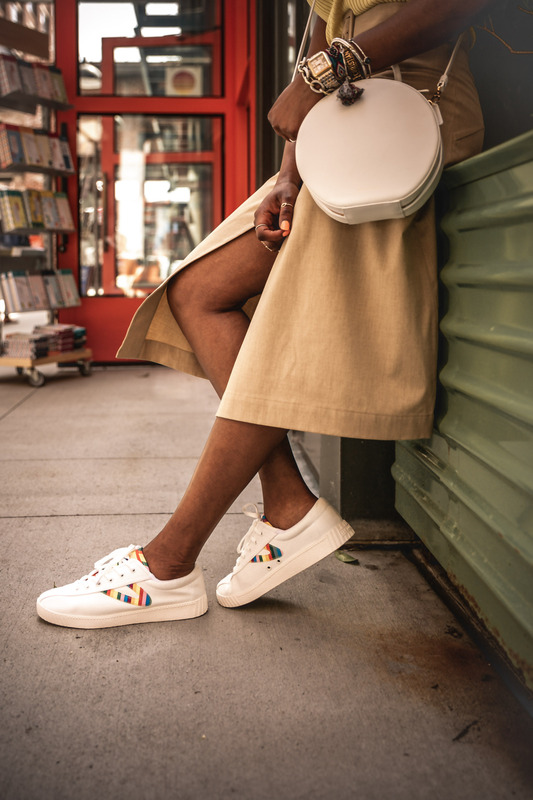 My white Tretorn sneakers feature a multitude of colors including yellow featured in my top, making it easy to introduced them to the outfit. White is a great complimentary color especially for spring, so when in doubt pair your look with white. A white bag pairs perfectly with my sneakers. To complete the look I introduce a futuristic pair of sunglasses. For brunch, I lose the sneakers for a pair of beige tie-front sandals, and a beige top handle bag. Matching accessories for Easter just seems right. The matching chic accessories give life to this Easter outfit. By simply pairing these pieces with the knit top, and skirt, the outfit instantly becomes elegant yet fun. 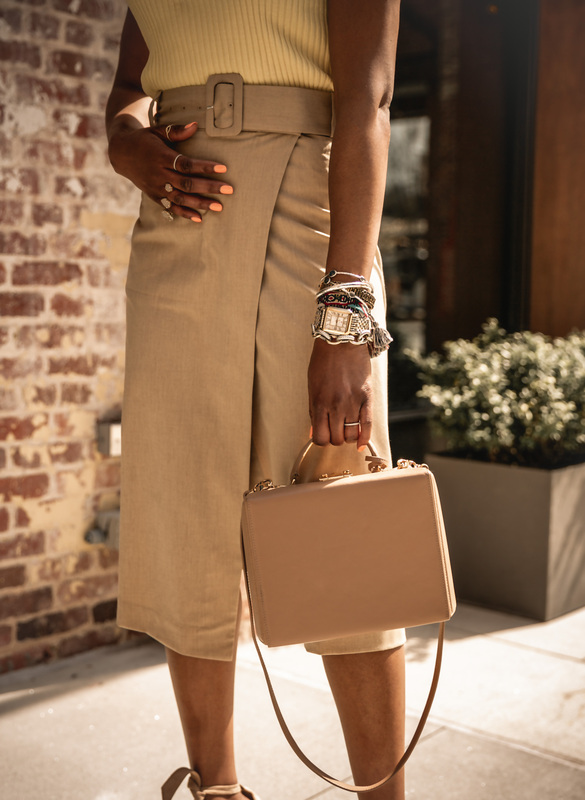 Both sets of accessories add a touch of chic to each outfit. 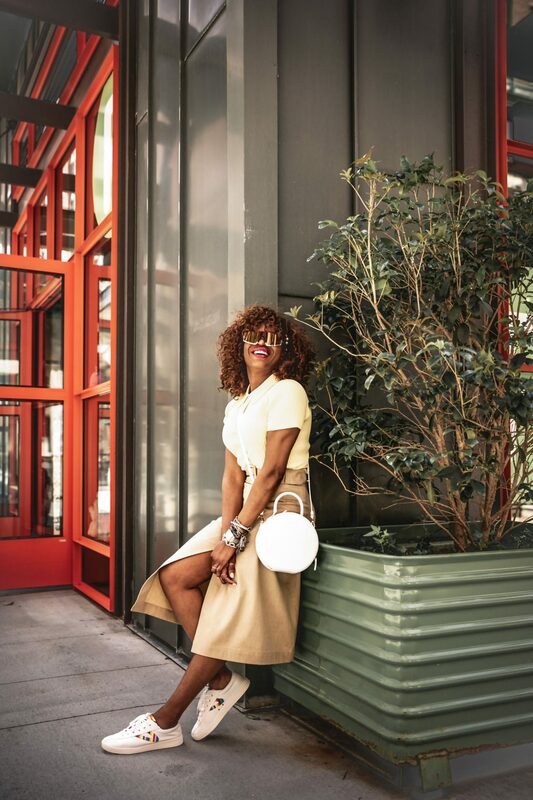 You can go classic-chic with heels and a structured tote, or casual-chic with a white cross-body bag and white sneakers. Shop both of these looks for Easter or any occasion below.